HomeShould Your Dog Go Grain-Free? Fill that food bowl with health, high-quality proteins and veggies. A spate of atypical cases of a serious heart condition in dogs is raising the question of whether grain-free dog food formulas are somehow responsible. The FDA is investigating a possible link between diet and the disease, dilated cardiomyopathy (DCM), in dog breeds where the condition is extremely rare. DCM causes the heart to become weak and enlarged; it can cause heart failure. Symptoms include coughing, fatigue, and difficulty breathing. Breeds that have a genetic predisposition for DCM include Irish wolfhounds, great Danes, and boxers. 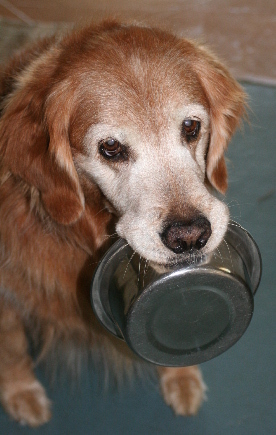 According to a New York Times article on the potential link with grain-free diets, concern was triggered when a large veterinary cardiology practice noticed an unusual number of cases among other breeds, including Labradors and golden retrievers. There’s no definitive link, and researchers are exploring whether the absence of grains in the diet could be problematic. Another potential problem: the legumes, like lentils and peas, that are used in large quantities to replace the grains in these foods. One avenue of research is whether the legumes inhibit the production of taurine, an essential amino acid that most dogs get from the meat in their diets or synthesize from amino acids in other proteins in their diets. To do this, they need to get enough real meat protein in their diets. To further complicate matters, not all meat proteins contain the same levels of taurine; poultry has more taurine than lamb or beef, for example. Choose a quality dog food brand that uses specified (named) meats and meat meals as the top ingredients. Use the Whole Dog Journal‘s list of approved dog foods, and you will not go wrong. Don’t use supermarket brands, which are full of fillers like corn and wheat (common allergens), artificial colors, sugar, and other potentially harmful ingredients. Choose a protein that is right for your dog. It’s unlikely that your dog needs an exotic, and expensive, protein like kangaroo. If your dog has shown signs of food allergy, sure, try a “novel” protein — but that just means one she hasn’t eaten before. Switch from chicken to fish or duck or lamb. I tend to favor foods with one or two proteins, rather than those with four, six, or more. This is simply convenience: If my dog were to develop a sensitivity, it’s easier to find a novel protein if she hasn’t been consuming lamb, beef, pork, chicken, turkey, bison, and fish at every meal. Ensure that the food has enough protein and that most or all of it is from high-quality meat sources. Many dogs do well with kibbles that are 25 percent to 30 percent protein; higher-protein foods are great for some dogs and not for others. Puppies will grow too quickly on a high-protein food. Educate yourself. Consult a vet or canine nutritionist, talk with knowledgeable experts at small pet stores that focus on high-quality foods (I’m not talking about those boutiques with a room full of doggy clothing and luxury accessories and only one or two very pricey foods), and read the Whole Dog Journal and Dogs Naturally. Make sure the other ingredients in the dog food are of good quality and, preferably, sourced in the U.S., Canada, or Europe. I’ve avoided any and all food products sourced in China since the melamine and other contamination scares several years ago. Pay attention to whether your dog runs hot or cold. A vet who treated Jana for many years (and who was Cali’s pediatrician) talked with me about “warming” and “cooling” foods. This turned out to be a wonderful guide to choosing proteins for my girls, who both were “hot.” Since moving to duck a few years ago, for example, Cali has not had a hot spot. Don’t treat your dog like a person. I am a committed vegetarian, but I know that neither Jana nor Cali had any desire to become vegetarians. While I have no desire to go gluten- or grain-free, if I did, that would not extend to my dogs. Dogs are omnivores. Give them a balanced, varied diet, avoiding things (like chocolate) that are known to be toxic or harmful to dogs. As to whether we should avoid the grain-free foods — the jury is out on that question. My advice would be to look at the specific food(s) you are feeding and see whether it meets the Whole Dog Journal’s criteria for a high-quality food. If so, and your dog is healthy and energetic, has normal digestive processes (translation: look at her poop) and a shiny, healthy coat and bright sparkly eyes, don’t make changes. If your fancy boutique food was selected based on the marketing copy or you’re simply following the latest diet craze, reconsider. What does Cali eat? For breakfast, she gets a Steve’s Real Food Turducken patty. For dinner, she gets a heaping cup-and-a-quarter of Canidae Sky limited ingredient duck formula. Yup, they’re grain free. They’re also chock-full of high quality, nutritious ingredients. She also gets fish oil, joint support and digestive enzyme supplements, eggs, cucumber, plenty of cookies (not grain-free!) and coconut popsicles (ice cubes made with coconut water), and all the fresh raspberries she can reach.